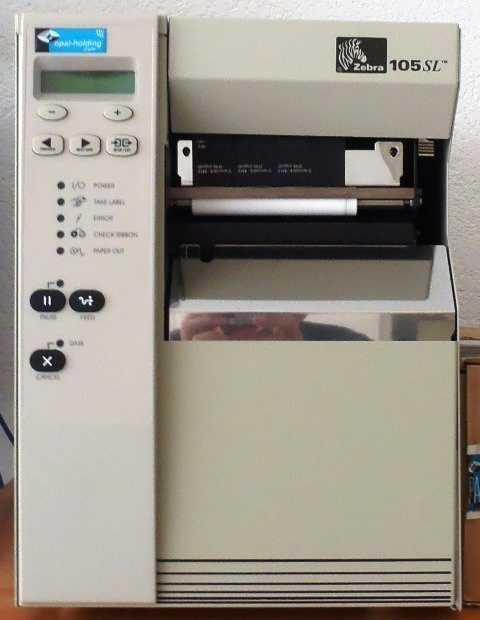 Parallel thermal label printer. Bar-coding. Standard 2-line, 16-character LCD control panel. Unicode compliant. XML-Enabled printing-direct-connect integration for bar code label printing; eliminates license fees and print server hardware and lowers customization and programming costs. Print Speed 8”/203 mm per second (203/300 dpi). Print Width 4.09”/104 mm. Print Length with 203 dpi: 106”/2,692 mm Print Length with 300 dpi (optional): 65”/1,651 mm. Option 300dpi and several ribbons (450 m). 100Base-TX and fast Ethernet 10/100 auto-switching networks. Compliant: UL 1950; CISPR 22 (Class B); CSA 950; IEC 950; 801-2, -3 and -4 standards; Canadian Doc. (Class A); FCC (Class A); CE compliance. Width: 283 mm x 394 mm x 495 mm. Weight: 55 lbs/25 kg.